Welcome to the 2014-2015 school year! I look forward to working with each student as we engage in an academically rigorous and rewarding investigation of U.S. History from the turn of the 19th Century through the present and Physical Science. My ultimate goal is to help each student, graduate and move on to high school better informed, more confident in their abilities, and prepared to enter a college preparatory program. It is important that students, parents, and teachers work together to achieve this goal. As we begin this school year, I want to take a few minutes to review some important student responsibly, common practices, and expectations for my class. These are the guidelines that I will follow throughout the year, so you may want to retain this letter for future reference. For your convenience, this information and much more is also available online at "The Front Seat”, our classroom website – thefrontseat.weebly.com. Students will need to visit the site throughout the year. I recommend bookmarking it for easy access. Paper Heading - This heading is used on all papers. Quizlet - This is a flash card and interactive tool. Each student will need their own account. There is an account option designed for students under the age of 13. EduCanon - Online video quiz tool. Students create an account managed by Mr. Woodmansee. Typically, I will assign a video with graded question to watch prior to coming to class. Digital Formats -Save all files in Microsoft compatible formats preferably: .doc, .docx, .ppt, and/or .pptx; for more information, see the “Quick Link” page on The Front Seat. There you will also find a tutorial for Mac users; if you do not have a good office suite visit Openoffice.org for a free office suite. QuizStar- This is an online quiz tool. I will assign usernames and passwords to students. Students will be asked to log into the site to complete assignments. The assignments are not timed. 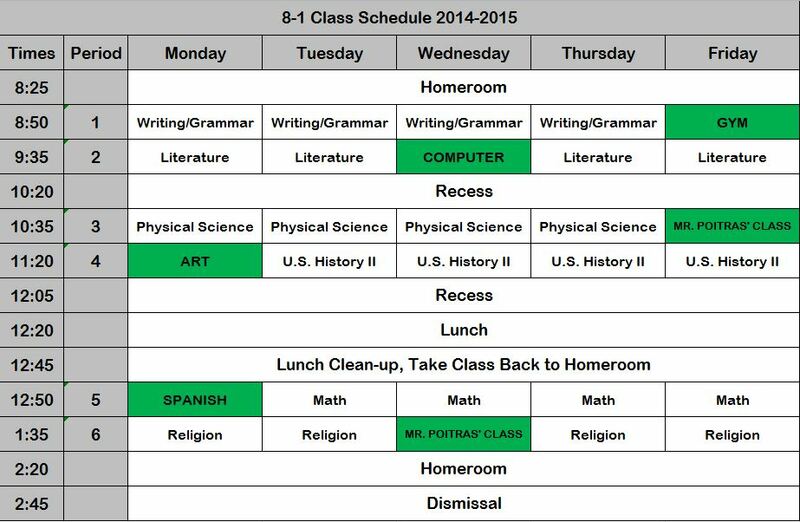 Students can take each assignment multiple times and use their books and notebooks. CURRENTLY, THIS IS ONLY AVALIABLE TO GRADE 8 STUDENTS BUT MAY BE EXTENDED TO GRADES 7 & 6. 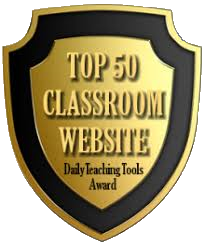 Other Online Tools - Please see the “Quick Links” page on The Front Seat for addition web-based tools. As technology changes so too will this list. "Discipline" is the training, correcting, and molding of a person's character. This is the very reason schools exist. Classroom discipline is not meant to be negative. In fact, it ensures that you, as well as your classmates' right to a productive learning environment is protected. Therefore, each student is expected to follow the following guidelines. Be Prepared – Bring all needed materials to class (book, notebook, pen/pencil, agenda, binder, and a reading book), get enough sleep, eat properly, and make sure you are hydrated. Dress Properly – Always come to class in uniform. Follow Directions – Listen to, read, and think about the directions before acting or asking to have them repeated. Do Your Work – Extra credit or make-up work will not be given to students who do not regularly complete their assignments. Keep Your Space Clean – If you bring something to class, take it with you when you leave. If you drop something on the floor, pick it up. If you make a mess, clean it up. If you use something, put it back. I'm sure you get the point. Respect The Speaker – Only one person speaks at a time and all ideas must be equally respected. Give Each Other Space – Keep a reasonable distance from classmates and give them physical as well as emotional space when needed. Act Honorably– We were all born with a conscience, the God-given internal ability to determine right from wrong. To act honorably, means to live in a way that is deserving of esteem and respect: to be chivalrous, conscientious, dependable, ethical, faithful (to God, yourself, and others), forthright, honest, just, lawful, noble, principled, reliable, sincere, trustworthy, truthful, upright, and virtuous. ﻿First Offense: For the first offence, a student will receive a written or verbal warning. Second Offense: For a second offense, a student will receive a 30 minute after school detention, and/or a homework assignment. Third Offense: For a third offense, a students will receive a 60 minute after school detention, and/or a homework assignment. Fourth Offense: For a fourth offense, a student will be sent to the office. The consequences will vary. Any student who fails to complete their work in a timely manner, is unprepared for class, is repeatedly disorganized or messy, does not listen to instruction, or fails to follow the above expectations in any way will receive recess detention. After three such detentions in a trimester, that student will receive an after school detention. After-school detentions range from 30 to 60 minutes. Sometimes I may assign a reflective written or verbal homework assignment. "﻿The Front Seat﻿" has grown over the years. It started as a Typepad blog, before moving to Teacherweb.com. Its current form emerged in the winter of 2014 when I was forced to transfer from Google Sites to Weebly because I exceeded the storage limited on Sites. Weebly.com offers unlimited storage and access to the sites HTML for advanced customization. 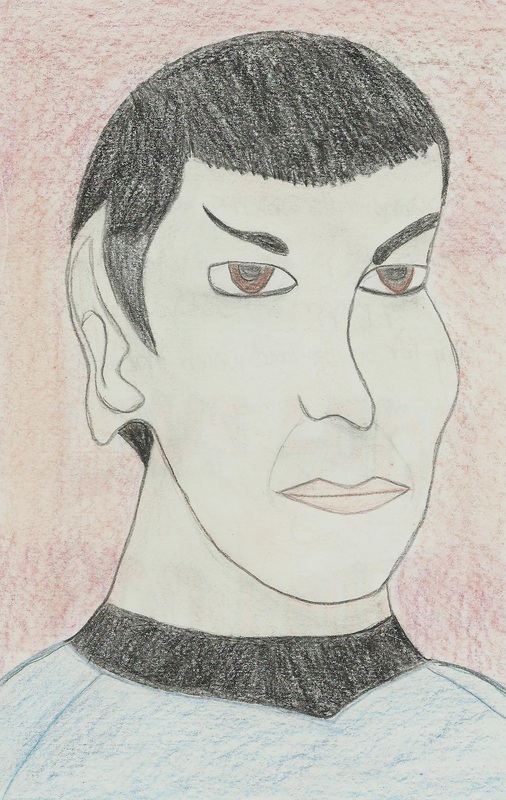 You will often see this hand-drawn image of Mr. Spock. This image has personal meaning to me. It was drawn by my younger sister, Sr. Colette who is novitiate with the Capuchin Sisters of Nazareth Sisters of Nazareth in Pennsylvania.